Last batch of bath bombs was a bit oily and my daughter was not very into it. It was then the time to try another recipe. Two summers ago I have been into a such an amazing trip to Province in France. I have incredibly wonderful memories from there and only thinking back puts me in a dreaming phase. I came back from there not only with memories but with 1kg of lavender essential oil. Yes, you read it well, 1 kg. I took it from a country farm, straight from the producer. Meantime I used it for relaxing moments although not at all during my pregnancy. 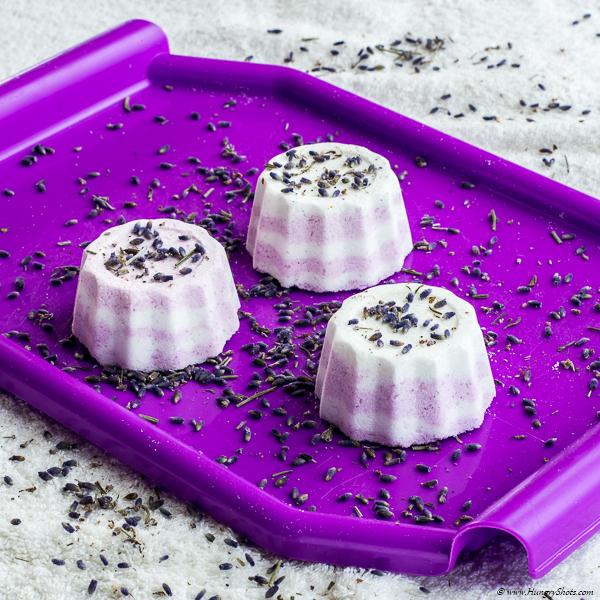 At that time I was not having in my mind to do soaps or any homemade cosmetics but I bought it because I was loving the smell of lavender and because I was buying it almost from the field. Adding soap colorant instead of food colorant gave a lighter color to the mixture. When using it in the water, it did not color the water that much. The smell from these bath bombs is persistent and so so relaxing. And yes, they fizz. Try it for your next relaxing hot bath! Mix with a wooden spoon the baking soda, citric acid, corn starch, epsom salt and soap colorant. Spray water and mix until you obtain a sandy mixture. Put the mixture into shapes and press it well. Let it dry for 4-5 hours.